« Glasgow Stereo Image Database of Garments has been released !!! CloPeMa Glasgow presented the CloPeMa project at the SICSA Demofest’13. 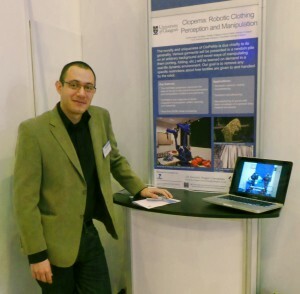 We had the great opportunity to present our research to a variety of industry partners on the 5th of November 2013, at the SICSA Demofest. SICSA stands for Scottish Informatics and Computer Science Alliance, who created the Demofest as an event to introduce industry to ongoing academic research. It is a chance to find industry partners who are interested in investing and collaborating in cutting edge research around the country. Tagged Clopema, industry, research, robot, videos. Bookmark the permalink.